Marlow Lodge is proud to be one of a select group of Lodges throughout England that is permitted to foster close ties with designated Universities and Colleges within its Masonic Province. Marlow Lodge being within the Province of Buckinghamshire has strong ties with the Buckinghamshire New University situated in High Wycombe, Buckinghamshire. We offer the Students and Graduates of South Buckinghamshire a chance to join Marlow Lodge at 18, younger than the normal age of 21 and in so doing become members of a Worldwide Fraternal organisation that will enable them to enhance their lives and also their sphere of friends. As a Lodge, we realise that some students reading this website may be put off when they see on the previous page the costs involved. However, as designated members of the Universities Scheme, we are allowed to vastly reduce the fees payable by up to 50% which would continue until they reach the age of 25. Any students from South Buckinghamshire who feel that they may wish to join Marlow Lodge are invited to contact the Lodge either by the “Contact Us” page or directly to the Secretary of the Lodge whose contact details can be found on the “Home” page. Arrangements can then be made in the first instance to meet established members of the Lodge where the many questions that a prospective joining candidate may have can be answered in an informal and relaxed surroundings. On the 11th November 2015, Marlow Lodge initiated Dr Timothy Coole, Head of Design, Media and Management at Buckinghamshire New University. The meeting was graced by the presence of W. Bro. Peter Moody, Assistant Provincial Grand Master and the Provincial liaison officer for the Universities Scheme, W. Bro Nigel Scott-Moncrieff, Vice-Chairman of the Universities Scheme of UGLE. 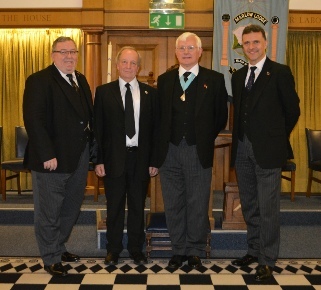 Worshipful Master W. Bro. Mark Wilson and W. Bro. Nigel Scott-Moncrieff.